Richard Hartshorne is the 10th great-grandfather of Richard, James, Gary, Lisa, Carl, Jane, Bruce, Cathy, Ron, Stacey, Matt and Sandy; and 11th great-grandfather of Asher, Owen, Caitlyn, Becky, Emily, Jack, Jill, Jordan, Mike and Brian. Richard Hartshorne was born the son of William and Anne (maiden name unknown) Hartshorne in 1641 in Hathearne, Leicestershire, England. Richard, a Quaker, was educated as a lawyer and emigrated to the Rhode Island Colony c1669. He married Margaret Carr on April 27, 1670, in Newport, Rhode Island. The newlyweds received a partially fenced piece of land from Margaret’s father, Robert, upon which Richard had a house built. Richard and Margaret had eleven children, beginning with Robert, born December 5, 1671. The others included Hugh (May 15, 1673, died before 1685), Thomas (October 14, 1674), Mary (August 14, 1676), William (January 22, 1678), Richard (February 17, 1681, died before 1689), Katherine (our ancestor; March 2, 1682), Hugh (June 21, 1685), Sarah (July 3, 1687), Richard (December 15, 1689), and Mercy (May 12, 1693). Shortly after the Dutch surrender of the New Netherland Colony to the English in 1664 a large tract of land known as the Navesink Patent or Monmouth Tract was granted to Quaker settlers from Long Island, Rhode Island and Massachusetts, which soon thereafter became the townships of Middletown and Shrewsbury. 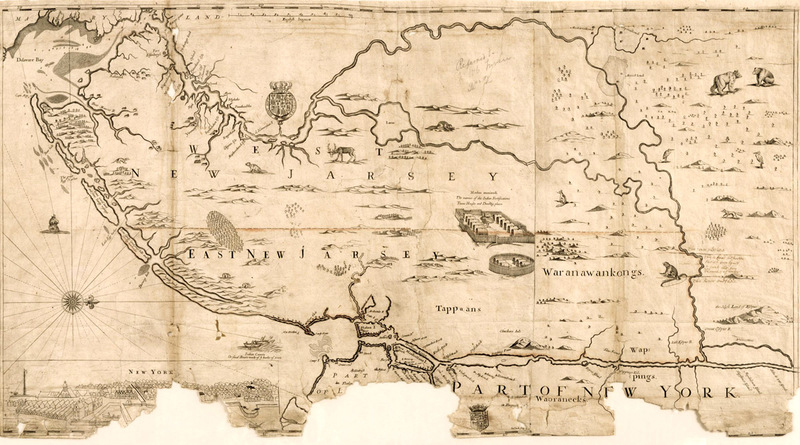 By 1674 Richard and Margaret had left Rhode Island for New Jersey, where Richard purchased land along the river and bay at present-day Navesink from Vowavapon and Tocus, chieftains of the Lenape. In 1677 Richard believed he had purchased present-day Sandy Hook from the Lenape, although there ensued a dispute about whether the Lenape intended to sell the land or just the fishing rights. “The Indians came to my house,” wrote Richard in 1678, “and laid their hands on the post and frame of the house and said the house was theirs, that they had never had anything for it and they told me if I would not buy the land I must be gone…. They at last told me that they would kill my cattle and burn my hay if I would not buy the land or be gone. Then I went to the Patentee office; they told me that it was never bought nor had the Indians anything for it.” Richard negotiated a settlement with the Lenape on August 8, 1678, in the amount of thirteen shillings for full title to the land. Richard held the office of town clerk of Middletown, New Jersey, was appointed a Justice in 1684 and elected a member of the Provincial Assembly in 1685. He held the position of Speaker of the Assembly from 1686 to 1693 and again from 1696 to 1698. Richard was also nominated for the office of High Sheriff of Monmouth County, a position he declined. In 1704 Richard made a record of his marriage and the dates of birth of his children. He wrote instructions to his children on serving God, caring for their mother and the necessity of government while on earth. Margaret died c1719. Richard wrote a will on May 14, 1722, in which he designated a legacy for the poor. Richard died shortly thereafter, on May 22, 1722. Richard is memorialized today in the name of Hartshorne Woods Park in Middletown Township, New Jersey.